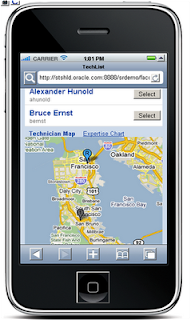 Applications and Integration Blog: iphone ADF Mobile Browser app to creates sales order in Oracle Application. 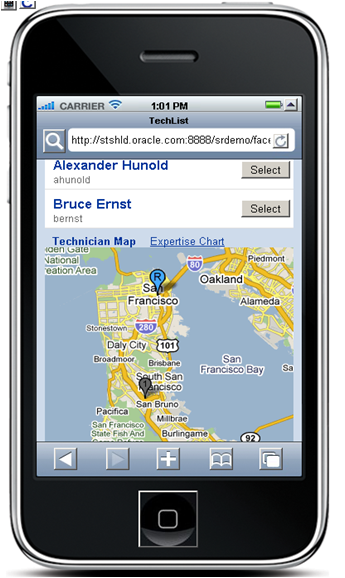 iphone ADF Mobile Browser app to creates sales order in Oracle Application. This is very interesting post about iphone Mobile Browser App Created with Oracle ADF to creates sales order in Oracle Application. In this post I will explain about building appliaction with "ADF Mobile Browser"
ADF Mobile browser application is almost identical to ADF Web application development , except the ADF Mobile browser application development uses only mobile JSF pages that consist of Apache Myfaces Trinidad components. In this way we can re-use the desktop browser application’s model and controller layers to assemble a new view layer for mobile devices by using similar Apache MyFaces Trinidad Components. More Info. about the ADF Mobile Browser are available in Below Demo. P.s - Yours commets are very much appreciated. The biggest benefit that Mobile Browser offers is that it allows you to see everything without reducing any content only for the reason that you are browsing using your mobile. It is an easy to use and easy to customize package. Thanks a lot. in the App Store has given rise to more and more developers pluging into the fray thus increasing supply while reducing the overall quality of apps.